I have missed blogging! A lot of good things been happening around here. Good work opportunities and a food photography and styling workshop with Nourish of Qout Market last week - all just feels surreal and I'm immensely grateful. It's not to say we haven't been cooking in fact my repertoire of cooking under 45 minutes has certainly increased many folds. So I thought perhaps, this is a good recipe to start start off this week. Halloumi zaatar sandwich has saved me through many quick five minutes lunches before our meetings during corporate years and now continues to be a fall back munch when I'm drowning in work. It is not even a recipe really, but if you haven't tried the combination, you are in for a treat. The salty halloumi, pungent zaatar and bitter olives contrast beautifully with sweet and juicy cherry tomatoes. This is also good time to bring out that fancy schmancy extra virgin olive oil as fruity flavours of the oil really shine through. This recipe is part of Inspired Middle Eastern feature I developed and shot for BBC Good Food India for their October issue. Slice the halloumi into thin strips. Heat olive oil in a pan and brown the halloumi on both sides. Remove from the flame and sprinkle with zaatar. Add the tomatoes, olives and onion in the same pan, and toss well. Season with salt and pepper. Slice the bread, layer the halloumi mixture in it and drizzle with extra virgin olive oil. 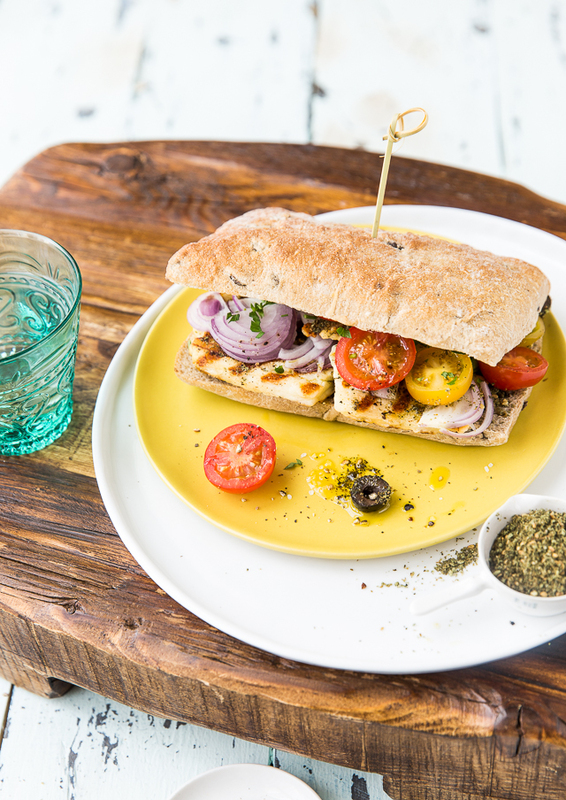 Let the juices of some of the tomatoes get soaked into the bread for extra flavour by squeezing some before layering the sandwich along with a drizzle of oil. Happy to see you back, and with an awesome recipe! This sounds dreamy! I do love a good halloumi sandwich. Never flavoured mine with za'atar before.. definitely a recipe I need to try. It looks delicious and I bet it tastes even better! Don't for get to drench it in Menelaus 100% Organic Greek Extra Virgin Olive Oil. Takes the taste to a whole other level! as usual, gorgeous and inspiring! it looks so good i am going now to make it for breakfast. thanks! Thanks Laura! Let me know how it goes. Thanks Kiran. I'm addicted to za'atar so I could be biased but you really have to add it to sandwiches! So happy for you for all the success n achievements Kulsum!!! Ooo, I like the sound of za'atar on grilled halloumi! this just looks so delicious! I love halloumi <3 I wanna eat it right now!!! Made these to use up a little extra za'atar. So good! A new favorite and perfect for weeknights.